soundSCAPE facilitates the flowering of new music and the exchange of ideas and culture between musicians of tomorrow's generation. Each summer in scenic Maccagno, Italy, soundSCAPE attracts composers and performers from around the world for two weeks of concerts, lectures, master classes and workshops. The essence of the festival is process and collaboration—soundSCAPE has been the starting point for new music initiatives that have flourished long beyond the festival, all around the globe. In 2013, soundSCAPE released its first CD on the New Focus Recordings label. 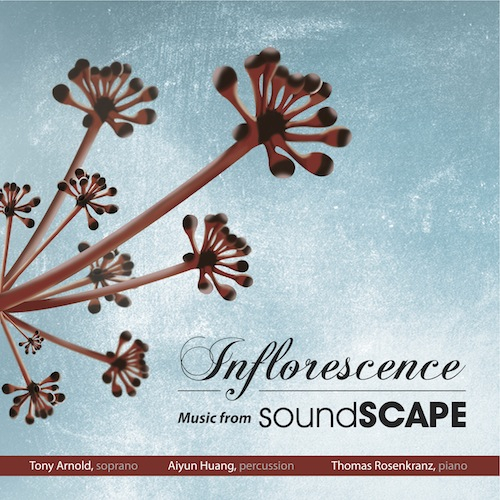 Inflorescence: Music from soundSCAPE features the faculty trio of soprano Tony Arnold, percussionist Aiyun Huang, and pianist Thomas Rosenkranz, who tour regularly as Musicians from soundSCAPE. The captivating disc is built around the eponymous work by Josh Levine, commissioned by soundSCAPE in 2012, and includes new works by Mark Applebaum, Richard Carrick. Rounding out the disc are scintillating solo works by Aperghis, Webern, and Rzewski. The Valkyries of soundSCAPE 2012: Stephanie Beattie, TA, Rebekah Alexander, and Liz Pearse. Are you a singer with broad interests in language, literature, and theater? Are you passionate about chamber music? Have you ever wanted to tackle challenging modern repertoire, but are not sure how to take the first step into extended techniques? Or maybe you have contemporary music experience? Join world-renown soprano and contemporary music specialist Tony Arnold at soundSCAPE for two weeks of intense study of solo contemporary vocal literature and chamber music. All levels of contemporary music experience are welcome. The specifics of the course will be designed around the individual abilities of each student, but the goal of the institute is to expose each participant to the diversity of contemporary vocal repertoire, to engage in discourse on performance techniques and practices, and to find the ways that contemporary music integrates and enhances every endeavor in music of all eras and genres. Singers of all levels – undergraduate, graduate and young professionals – are welcome. Knowledge of a broad body of repertoire from the Baroque through the early 20th century (especially Lieder and art song repertoire) is required. Singers new to contemporary music: focus will be on both solo and group repertoire that will expand the timbral palette available to singers. Repertoire will include works such as Georges Aperghis: Récitations; John Cage: Aria; and Cathy Berberian: Stripsody. Singers with contemporary music experience: focus will be on repertoire already in process. Technically advanced pieces to be considered will include Aperghis: Récitations; Berio: Sequenza III; Schoenberg: Pierrot Lunaire; Jason Eckardt: Dithyramb; as well as other repertoire ranging from Webern to Messiaen to Birtwistle. Performances in solo recital are an integral part of the Institute. In addition to the solo work, participants will join in the rehearsing and performance of new works for chamber ensembles, either discovering first hand what it is like to work with a composer to bring a new work to life or lending their experience to the piece and the composer. Click here to apply to soundSCAPE! A range of financial assistance is available. And please feel free to contact Tony with repertoire questions and ideas.